Lost in Time: The Clockwork is a new hidden object/adventure game release telling you how every act has its consequences. You are to join a girl that has broken the town's clock and now is responcible for fixing it as well as for fixing the time which got damaged too. The game is full of everything to make it a good one, but not a flawless one. 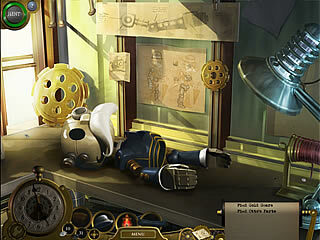 The hidden object scenes are scattered through the game, but they don't make up the bigger part of the game. You play as Eliza, a young woman who found her way into the town's clock tower. One of the things that she did was braking the clock. Now she is to find all of the parts necessary for fixing it. Later she finds out that the very fabric of time was damaged around her village. Now she is also to solve that somehow as some of the citizens are trapped in the time shifts. And she is lucky to be able to help them out thanks to the assistance of a mysterious man speaking to her through her pocket watch. 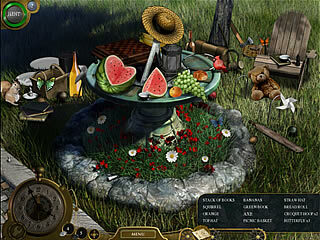 The game is more of the adventure type, not a pure hidden object one. 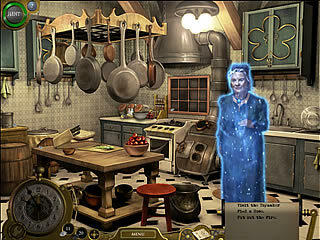 The hidden object scenes are scattered through the game, but they don't make up the bigger part of the game. Those few hidden object levels that you get to play in the game are not that unique and stunning especially if you have played enough to know how good those can be. The rest of the time you are going to interact with other characters or items. You will ususally have several tasks to complete. One of the tasks that is to be completed all the time is upgrading your pocket watch. Those upgrades allow you to control more and more aspects of time. You do the upgrading by finding gears all the way through the game. It gives you different powers like fast travelling or time reversing. Each location is rich in two kinds of materials: coal and diamonds. Coal can be transformed into diamonds, and diamonds can be used to buy things, like food or tools. The graphics of the game are pretty satisfying and fit in the great story perfectly. If you want to enjoy them more, you can get an in-game art book. As to the flaws of the game, the biggest flaw probably is the hint system, which is not very helpful sometimes when you are lost what to do next. Even that one thing can easily be overcome with everything else going on in the game. This is Lost in Time: The Clockwork Tower review. Download this game here.